Enviro Concept have a variety of ways to treat water. Filtration is a common way to remove the larger particles and suspended solids found in the water. Filtration is often the primary stage of treatment before it goes through the desalination process as well as other water treatment processes, and can also be the polishing stage for waste water treatment processes. There are many types of filtration. The classic filtration systems used are Micro filtration, Ultra filtration, and Multimedia and Cartridge Filtration. 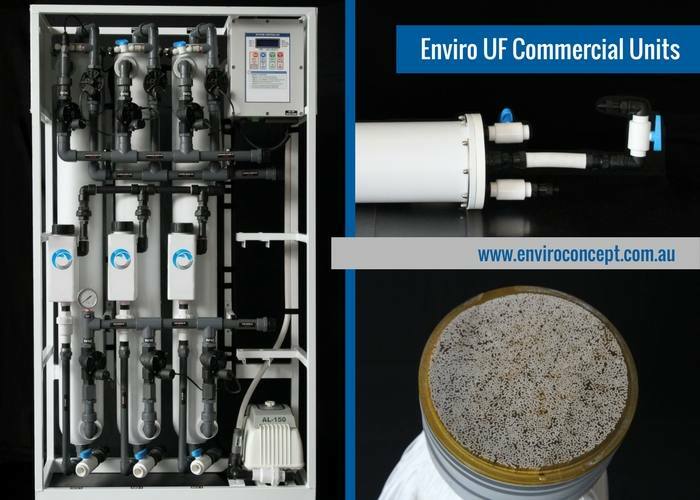 Enviro Concepts offer Ultra Filtration (UF) plants that are suitable for treatment of surface water, storm water, waste water and tertiary treated effluent. Our ultra filtration systems can handle water with high variables such as <300 NTU of turbidity and <150mg/L of suspended solids. Our treatment process that includes UF commonly uses a 5-10 µm (micron) cartridge or bag filter for pre filtration before the ultra filtration process which comes equipped with automatic backwash and air-scouring systems for regeneration, then the membrane is cleaned using a Clean-In-Place (CIP) system. Our UF systems can be adapted to add other water treatment products to meet your needs. These can include sterilisation, Reverse Osmosis, pH correction and even iron removal. Enviro Concepts also have skid mounted units for use on the move or containerised units for a more long term option. We also offer Ultrafiltration for our commercial customers and projects that require clean drinking water for communities. Our EnviroUF-Pro range can provide cost-effective, safe, potable water solutions. It is a compact, modular unit with simple “plug-in” solutions that can be easily installed and maintained. We understand that there are various applications for our Ultrafiltration range. Click here to download UF Filtration specification sheet. To discuss how we can help you to better manage your water filtration needs, contact us here.